The three-leading scorers from Virginia's national title-winning roster -- Ty Jerome, De'Andre Hunter and Kyle Guy -- have all formally submitted paperwork to enter the 2019 NBA Draft process. Jerome and Hunter, projected first-round draft picks who averaged 13.6 and 15.2 points per game last season, respectively, announced their decisions on Monday. Guy, UVA's leading scorer and the Final Four MOP, joined the duo by announcing his decision on Tuesday afternoon. "I set a goal with my brothers when we committed to UVA," Guy said in a statement on Twitter. "Three years later we accomplished that goal of winning a National Championship. I also set a goal for myself to play in the NBA. Today I will be declaring for the 2019 draft and signing with an agent." Guy said he will leave the door open to come back to school, dependent upon the evaluation he gets during the draft process. For the first time this season, undergraduate players can hire an agent and still return to school if they withdraw from the draft process before 11:59 p.m. ET May 29. 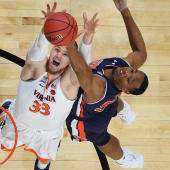 The Virginia trio makes up for only a small sliver of the more than 75 prospects who have entered the draft this season. Over the weekend, Southern California's Kevin Porter Jr. joined the fold of those who have also declared. Duke stars Cam Reddish and RJ Barrett, as well as Kentucky standouts Keldon Johnson, PJ Washington and Tyler Herro, have also submitted their names for entry into the pre-draft process. Projected lottery picks Ja Morant, Darius Garland, Coby White and Nassir Little have also declared and signed with agents. We've compiled a full list of those who have declared early for the upcoming 2019 NBA Draft along with a look at who is and isn't planning to hire an agent, which, as noted, is less consequential than years past. Individuals who hire an agent do not automatically forfeit any college eligibility and the opportunity to return to school; those who test the draft waters can go through the process and return to school so long as they announce their decision to withdraw by May 29 at 11:59 p.m. ET.